Sean Wigggins, Stephen K. Peeples and Paul Houston after their "House Blend" taping wrapped. Sean Wiggins and Paul Houston on SCVTV’s “House Blend” with Stephen K. Peeples. Photo: (c) Stephen K. Peeples. Rock ’n’ soul singer, writer, guitarist, bandleader and indie recording artist Sean Wiggins is the featured performer on the Season 3 premiere of “House Blend,” the WAVE award-nominated music-and-interview program on SCVTV hosted by veteran music journalist Stephen K. Peeples, debuting on Saturday, Jan. 5, at 10 p.m. Pacific Time. Wiggins on vocals and acoustic guitar is accompanied on the show by lead guitarist and producer Paul Houston. 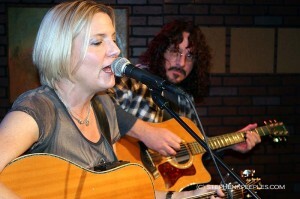 Both are members of the popular Santa Clarita Valley band lOne gOat. 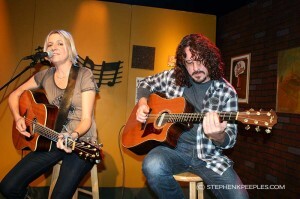 The duo appears on “House Blend” in an acoustic format performing exclusive unplugged versions of four songs from the three Sean Wiggins and lOne gOat albums. The set includes “Watchin’ the World Go By” (from “The Kitchen Sink”); “The Orchid Lounge” (from “Everyday Life”) and “The New L.A. Blues” and “Closer to Me” (from “Naked Thursdays,” the band’s most recent album). Wiggins also chats with Peeples for a few minutes between songs about her colorful background, which includes winning a Billboard song contest and having songs included on “MTV Undressed” as well as TV soundtracks and benefit compilations. Wiggins, originally from New York City, grew up in Oregon, where she sang and toured with a local jazz combo while still in high school. After a short time studying at UCLA and living in the SCV, she returned to New York for private study in music, voice, drama and dance. She had been in numerous bands and duos by 1999, when she went solo, recording her first album, and began touring the States, playing the festival and club circuits. Wiggins returned to the Santa Clarita Valley about eight years ago. She met Houston when she played a nightclub he was managing in the San Fernando Valley. He liked her so much he asked to jam with her; when they did a week or so later, his rootsy style perfectly complemented Wiggins’ soulful singing, and they’ve worked together ever since. Sean Wiggins, Stephen K. Peeples and Paul Houston after their “House Blend” taping wrapped. Wiggins and another frequent acoustic duo partner, harmonica player Laurie Melan, play at Valencia Wine Co. on Jan. 17 and 31; and Wiggins reunites with Paul Houston at Wine 661 on Jan. 25. lOne gOat’s next gig is Feb. 20 at the Keynote Lounge in Ventura. For more info about Wiggins and Houston and lOne gOat, visit seanwiggins.com. “House Blend” is co-produced at the SCVTV Media Center in Newhall, Calif., by Peeples and SCVTV’s Megan Perez, who also directs with SCVTV’s Austin Dave. SCVTV CEO Leon Worden is the executive producer. “House Blend,” which premiered on SCVTV in September 2010, airs Saturdays at 10 p.m. Pacific Time and encores Thursdays at the same time. It is seen on Time Warner Cable Channel 20 in the Santa Clarita Valley, and AT&T U-Verse Channel 99 throughout Los Angeles and Orange counties. The program also streams live at the same times everywhere via the Web at scvtv.com. 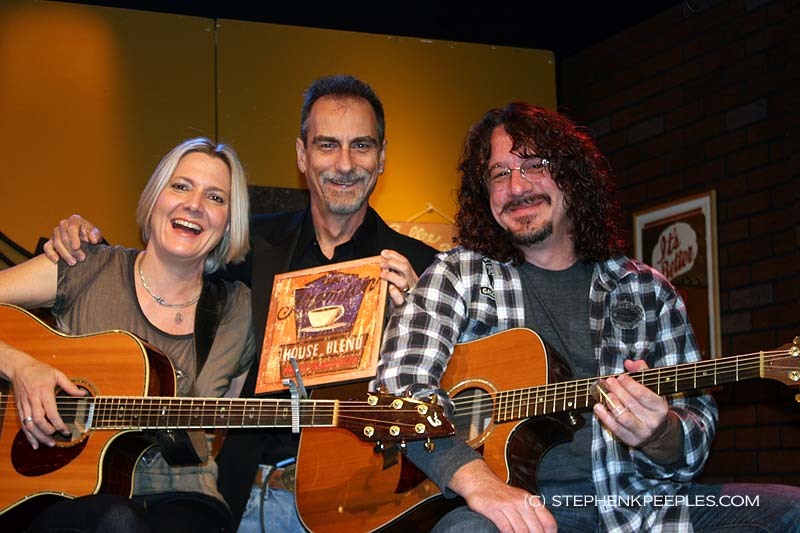 All “House Blend” shows produced — more than 30 original editions with music and interviews and a dozen all-music best-of compilations — are also archived and viewable on demand at SCVHouseBlend.com. A series highlight is the May 2011 “House Blend” program featuring folk-country-bluegrass legends Chris Hillman and Herb Pedersen, one of three finalists for a WAVE award from the Western Alliance for Community Media. Read more here. For booking, sponsorship and other information about “House Blend,” email houseblend@scvtv.com. In addition to his “Peeples Place at KHTS” blog, Stephen K. Peeples is a features writer/reporter for KHTS News (hometownstation.com) and SCVNews.com, and host, writer and co-producer of the weekly “House Blend” music and interview television show on SCVTV, community television for the Santa Clarita Valley (scvhouseblend.com). A former SCV music and entertainment columnist for The Signal (2004-2011) and drummer with SCV jazz group RainTree (raintreejazz.com, 2010-2011), Peeples is a Grammy-nominated record producer (“Monterey International Pop Festival,” MIPF/Rhino, 1992), an award-winning radio producer (“The Lost Lennon Tapes,” Westwood One, 1988-1990) and an award-winning online editor (The Signal website, 2007-2011). For more information, email skp@stephenkpeeples.com or visit stephenkpeeples.com.